i mentioned yesterday that i'm not irish, so i tend to not really celebrate st. patrick's day at all. however, once in a while i do get a craving for irish soda bread. so, in honor of st. patrick's day i decided to be festive and to make some irish soda bread. instead of making it into a loaf, i made it into scones. this recipe was so easy. honestly, it has to be the simplest "bread" recipe that i have ever made. 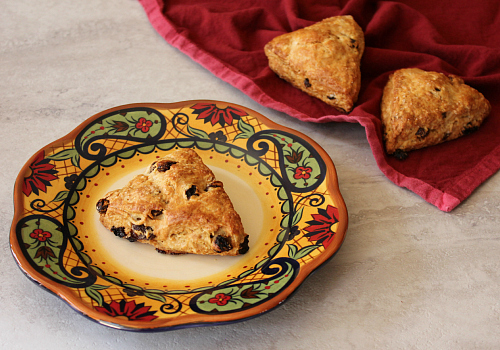 there are only a handful of ingredients, and they come together in just a few moments to make the most delicious scones. buttermilk is brushed on these scones before they bake to give them a wonderful crust on the outside, and the butter inside makes them perfectly flaky. seriously, these things are addictive. i made them on saturday morning, and we polished them off in no time. they are great with some scrabbled eggs for breakfast, or just as a treat with a cup of coffee or tea. this recipe is a keeper for sure. i can't wait to make these again! preheat your oven to 425 degrees F. in a bowl, combine the flour, baking soda, and sugar. using a box grater, grate the cold butter into the dry ingredients. cut the butter into the flour mixture with a pastry cutter until the butter is well distributed. add the raisins and toss to coat them in the flour. make a well in the center of the mixture, and pour in the buttermilk. use a spatula to incorporate the buttermilk into the flour mixture. turn the dough out onto a lightly floured surface and knead until it comes together. form the dough into a circular disk approximately 8-9 inches in diameter. cut the dough evenly into 6 triangles. place the triangles on a baking sheet lined with parchment paper. freeze the triangles on the baking sheet for 10 minutes. remove the baking sheet from the freezer, and brush the triangles with buttermilk. sprinkle the tops with a bit of salt and granulated sugar. bake for 20-25 minutes, until golden brown. serve warm with butter. 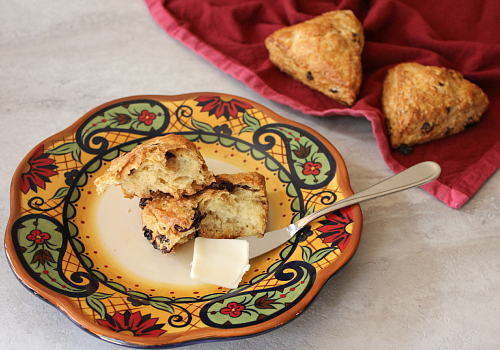 The scones I make have more of a dense cake texture (and they are absolutely delicious!) but I love how these look like a flakey pastry. I will have to try them, for sure :) Thanks for sharing! That looks so good. 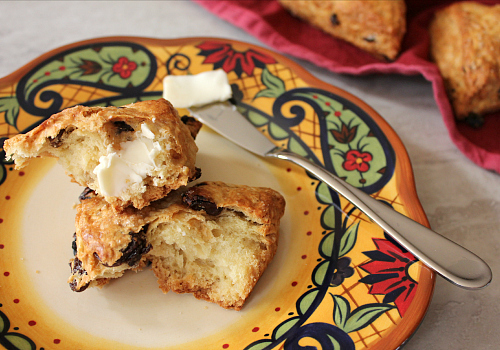 I like soda bread but never had them in scone form. I love that plate, I'm thinking that would fit my plate holder that I can not find a plate to match.